Someone is at fault, but it’s hard to know who. Let’s talk about No. 3, today. The auto accident rules of the road are usually pretty easy–most of them are “common sense” acquired by most of us drivers over the years. Many rules on the “standard of care” owed by drivers to one another have been lovingly written by the Maryland legislature, mostly in the Transportation Code. But sometimes, a client comes in and tells you what happened. It might sound okay, but some of the details are fuzzy. Technology is a wonderful thing, so I frequently visit Google Earth for a bird’s eye view and street view of the accident. Unfortunately, not all rules are laid out in the Maryland Transportation Code. Sure, there is some discussion of traffic control devices, flashing signals and the like (see here). But what about the actual rules regarding when you can cross a double yellow line? There are a lot of road signs and other marking rules, and they are not always obvious. One source of additional rules, infrequently used in court, is the Maryland Driver’s Manual. 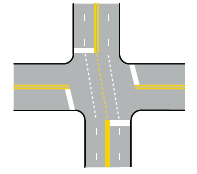 If you have questions about the single white hashed lines, or the meaning of sign colors, or the meaning of roadway symbols, this is the place to look. If you know that some tidbit from the MVA Driver’s Manual might be useful at trial, you might ask the defendant interrogatories to figure out when he/she last took a written driving test. You can try to obtain the driving manual from that year to use in cross-examination to help establish the standard of care. Or, you can try to use the driving manual from the current year. That manual can help to establish some of the “common sense” rules.